A few months ago, I started experimenting with “crusts” made from pasta. I tried various binder combinations of eggs, cheese, milk, and olive oil until I hit on this version. We love it. The concept is fun, the taste is delicious, and the crust can be a base for all sorts of toppings. While I typically use whole wheat spaghetti, I recently tried a corn and rice pasta for a gluten-free version. It is pictured above, and I would use it again in a heartbeat. No one knew the difference…and my gluten-free dad is going to love it! Click HERE for the Asiago Pesto recipe and HERE for the Balsamic Pesto Tomato Sauce recipe. The combination of cheeses adds great flavor to the crust. You may include your favorite pizza toppings and serve with additional marinara sauce, if desired. Cook pasta according to package directions. Drain well and cool slightly. Mix pasta, eggs, 1/2 cup mozzarella and cheddar cheese until cheese is evenly dispersed. Press pasta mixture into a lightly greased 9-inch pie plate and bake for 20 minutes. Remove from oven and spread the pesto, then the sauce, evenly over the pasta. Sprinkle remaining mozzarella over the top. Bake an additional 5 minutes or until cheese is melted. Sounds awesome. Can’t wait to try it! Another one I will try also. I love this blog.. It is comments like yours that make this labor of love completely worthwhile, Mary Lou. Thank you! Ann, you know, I have made the marinara and the pesto for it, but I’ve yet to try this recipe! 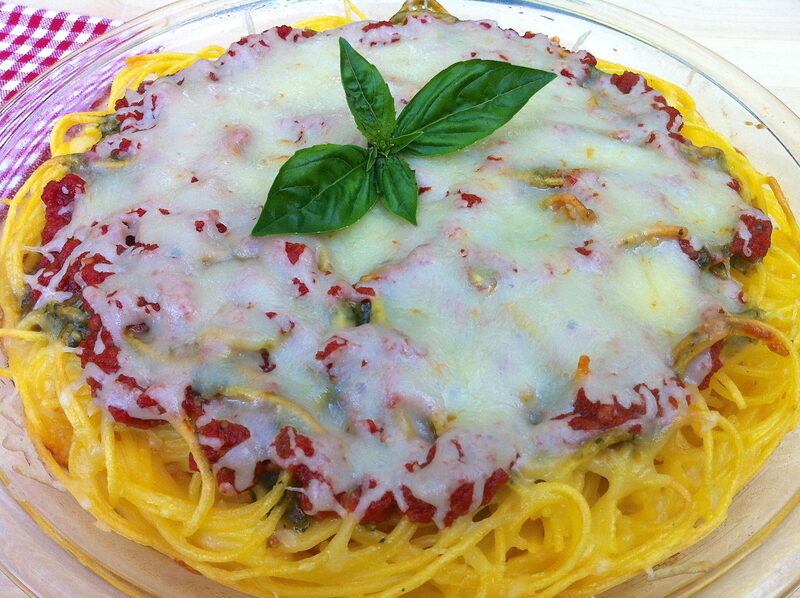 Now, I am wondering, would this work using spaghetti squash as the pasta do you think? I am curious to know what you think! I haven’t tried, Mary Lou, but it sounds delicious! While the texture will not be exactly the same, it couldn’t taste bad and you might just hit on something wonderful. Let me know if you give this a try (before I do)! This is absolutely delicious and has some fun factor. We loved it!